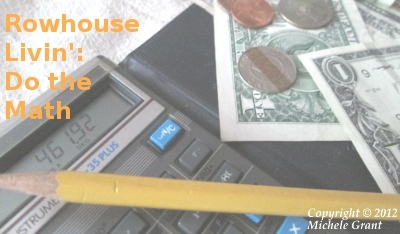 Ounce for ounce, and use for use, bar soap is cheaper than liquid soap. Bar soap probably has a smaller carbon footprint, too, since it's lighter to ship, per use, than liquid soap; and one of the cheapest brands, Ivory, is made in North America -- as opposed to a lot of the liquid soap I see, which is made in China. 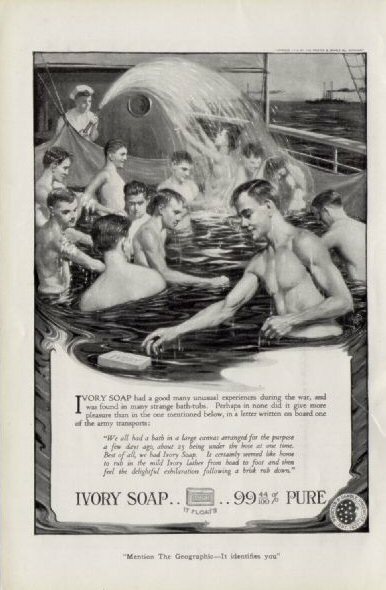 Ivory Soap: used in the hosing-downs on army transport ships during the Great War, according to this old ad in a National Geographic magazine, presented here for purely beefcake purposes. Larger version. Why does everyone use liquid soap? (Note: that antibacterial soaps are bad and a waste of money is not a question. This post is only about bar soap versus conventional liquid soap.) Is liquid soap more sanitary? I found one secondary source that says "[g]erms can grow on bar soap." But wouldn't viruses, molds, and bacteria just wash off your hands with the mechanical action of washing and rinsing, and the chemical action of soap micelles forming around them? And what bacteria can grow on bar soap, anyway? I thought one of the basic (ha-ha) things about soap was that it lyses bacteria when the business end of a hydrophobic-hydophilic soap molecule disrupts a bacterium's lipid membrane. There must be more types of bacteria in heaven and earth, Horatio, than are dreamt of in my philosophy. Say you use 1/2 teaspoon of Dr. Bronner's or Softsoap for every hand washing. There are 6 teaspoons, or 12 half-teaspoons, in every ounce. So one quart of Dr. Bronner's will give you 384 hand washings, at $0.039, or about 4 cents, per wash. (Many people dilute their Dr. Bronner's or use only a drop at a time, so I'll be happy to go with half that number and call it 2 cents per wash.) The 45 ounces of Softsoap bottles will give you 540 hand washings, at $0.0167, or between 1 and 2 cents, per wash. So the big question is, to beat the Softsoap price, how many hand washings will you get out of $9.00 worth of that 16-bar pack of bar soap? I think I get about 700 hand washings out of 3 bars of soap, because I wash my hands in the kitchen about twice per day (more when I'm home, less when I'm not or when someone else is cooking), and I go through 3 bars of soap at most at my kitchen sink every year. Each bar of soap costs $1.60. So that's $4.80 / 700, or $0.0068, barely 1 cent per wash. That sounds like a low number of bars of soap; but even if I ratchet it up to 1 bar every other month, I'm spending 6 * $1.60 / 700, or $0.013. It's not until I go to 8 bars per 700 hand washings (8 * $1.60 / 700 = $0.018) that Softsoap wins. And that's assuming the calculus is only about price. Maybe you would consider carbon-footprint concerns like packaging and shipping: Dr. Bronner's plastic bottles, Softsoap's plastic bottles and mixed-material pumps, and bar soap's wax paper and plastic film packaging. And how much oil to ship a package containing 384 versus 540 versus 700+ hand washings? Note that under no circumstances is it acceptable to skip hand washing in order to save money. Ben Franklin didn't live to see the germ theory of disease fully developed, but his "an ounce of prevention is worth a pound of cure" seems eerily prescient. Had a discussion with my fiancée about bar vs. liquid and we didn't know where to start with the cost analysis since we both live with our families. This is a starting point for one aspect of the discussion. How much to keep on hand? From the Bookshelf: "Passport to Survival"
Shift in attitudes or short-term behavior change? Timely: How long can you go without electricity? New Interactive Kaiju Magnets! Hyper Battle Kaiju Fight! The author is a lawyer living in Philadelphia, Pennsylvania, working on a move to St. John's, Newfoundland and Labrador, in Autumn, 2017. 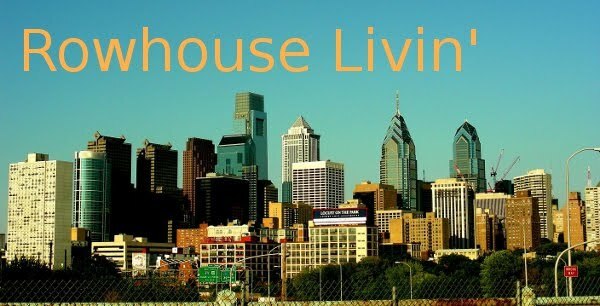 This is a blog about the move, in addition to its earlier forcus on urban home economics: low-cost healthy eating, pantry planning, emergency preparedness, and stretching your dollars in the city. All material on the blog, including but not limited to text and photos, is copyright © Michele Grant as of the date posted, except for the banner image, adapted from Philly Skyline, which is copyright © 2010 Ray Skwire and used by permission. All rights reserved by their respective owners.